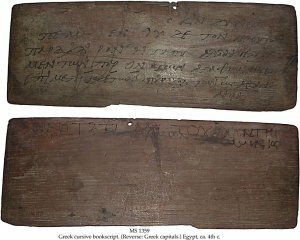 Description	 MS in Greek on wood, Egypt, ca. 500, 1 tablet, 14x38 cm, single column, (10x34 cm), 6+2 lines in a clear Greek cursive (side 1), and Greek capitals (side 2). Binding	 Barking, Essex, 1995, blue cloth gilt folding case, by Aquarius. 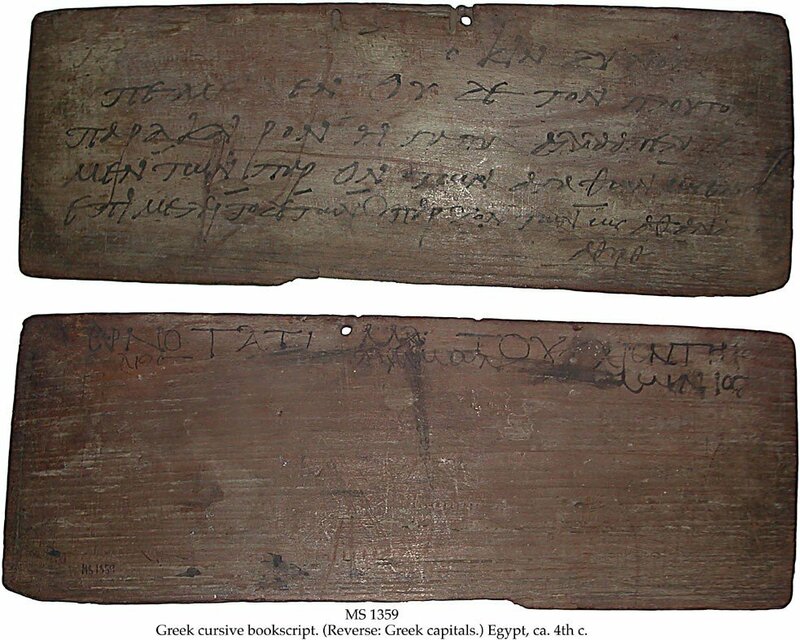 Context	 Other examples of writing practice from Egypt, see MSS 112/29, 1802/13 and 2263/18. Provenance	 1. Moen collection (1970'ies-1980'ies); 2. Bonhams 29.4.1991:77; 3. Sam Fogg Rare Books Ltd., London. Commentary	 The maxim of the Athenian orator preserved here is: ". . . and he exposed his spirit to dangers. Nor did he display an ill-timed craving for wealth, but he enjoyed the good things present like one who was going to die, yet cared for his property as if he was immortal". Published	 P.J. Sijpesteijn in Zeitschrift für Papyrologie und Epigraphik 52, 1983, pp.291-2. Papyrologica Florentina, vol. XXXV. Rosario Pintaudi: Papyri Graecae Schøyen. Firenze, Edizioni Gonnelli, 2005 (Manuscripts in The Schøyen Collection V: Greek papyri, vol. I), pp. 37-40.